Quality craftsmanship goes into this fun Patchwork Cowhide boot. These comfortable easy to wear boots are ideal for casual wear and parties. They come in several color combinations. 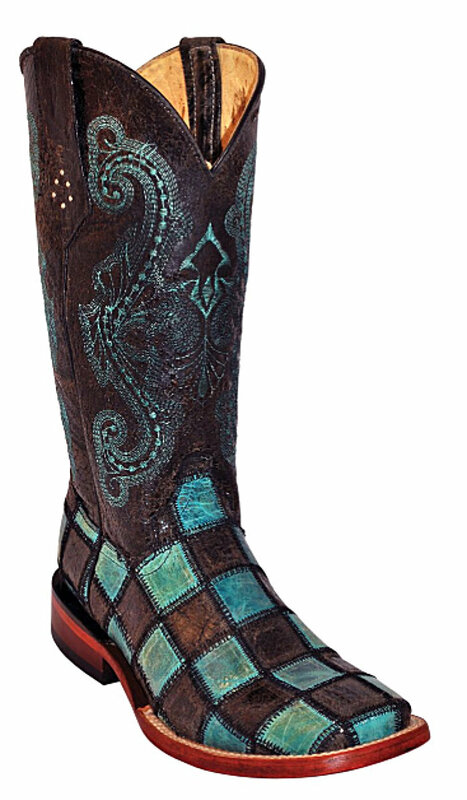 These S-Toe boots are patchwork leather on the foot and a black shaft with fancy color matching stitching. The heels are medium walking and the soles are leather. Sometimes we just do something for fun! Design: Only the latest designs and unique styles are used to produce the specialty line of exclusive leather products. Leather: Only the finest quality natural leathers and exotic skins from around the world go into Ferrini boots and shoes. Orthopedic Cushioned: Orthopedic foot-beds to assure the most comfortable footwear. Leather Lining & Soles: Fully leather lined, leather soles installed with hand-driven wooden pegs.